Hummingbirds are exclusive to the Western Hemisphere and a handful of them enjoy frequenting the Pacific Northwest. Varied as they may look and act, the Pacific Northwest hummingbirds share a love of nectar, and gladly will drink from the sugar-water feeders you hang in your yard. Sweets aren't their only source of food, though. The hummingbirds of the Pacific Northwest also eat insects including flies, ants and wasps to get a daily allowance of protein. With more than 300 different species of hummingbirds in the Western Hemisphere, it's not remarkable that more than one kind can be found in the Pacific Northwest. Yet out of all the different types of hummingbirds in existence, only three make part- or full-time residence in the Pacific Northwest. Those are the Allen's hummingbird, Anna's hummingbird and rufous hummingbird. Most hummingbirds are aggressive go-getters, but according to the Cornell Lab of Ornithology, the rufous hummingbird is the feistiest hummingbird in North America. These colorful little guys won't think twice about bullying other hummingbirds, even when they're not on their home turf. Comparable in size to the other two Pacific Northwest hummers, the rufous is typically 3 to 3.5 inches long and tips the scales at a whopping 0.1 ounce. Typical of most animals in nature, the males are the more colorful of the species with bright orange on their little bodies, brilliant red throats and glossy greenish-bronze adorning their crowns and backs. Although not as radiant, the female rufous do have spots of orange and reddish-brown adorning their green bodies. The rufous are the elderly of the lot, with an average life span of 8.9 years. 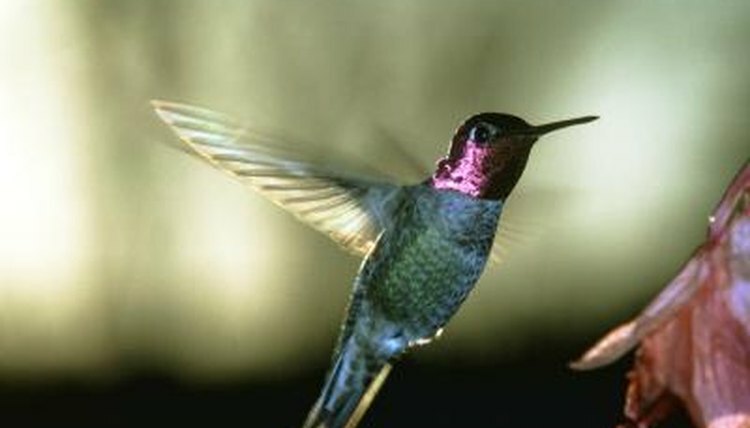 Anna's hummingbirds are territorial, but don't extend their aggressiveness past their chosen area, like the rufous will. Anna's are the second longest-lived hummers, living an average of 8.5 years in the wild. The males' brilliant coloring is reminiscent of glittering jewels such as rubies and emeralds. Both males and females have gray-green bodies that sparkle metallic in the sunlight. The boys have a brilliant hood of pinkish-red feathers and a gray-white chest while the females' only decoration is a spot of ruby or amethyst at the center of their throats. The largest of the Pacific Northwest hummingbirds, Anna's average 3.9 inches in length and can weigh up to a whopping 0.16 of an ounce. Allen's hummingbirds fit right in the middle of the Pacific Northwest hummers, size-wise. Just like their contemporaries, they're not much bigger or heavier than a ping-pong ball, measuring out to around 3.5 inches and weighing about 0.11 of an ounce. Also like their other Pacific Northwest counterparts, Allen's are territorial, but the males and females stake out separate feeding areas to defend. With their blazing orange-red throats and metallic green heads and backs, male Allen's hummingbirds look similar to their rufous cousins. The females sport green on their upper bodies with a splash of brownish-orange on their sides and tails. These little guys live the shortest length of time of any of the Pacific Northwest hummingbirds, typically only making it four years in the wild.